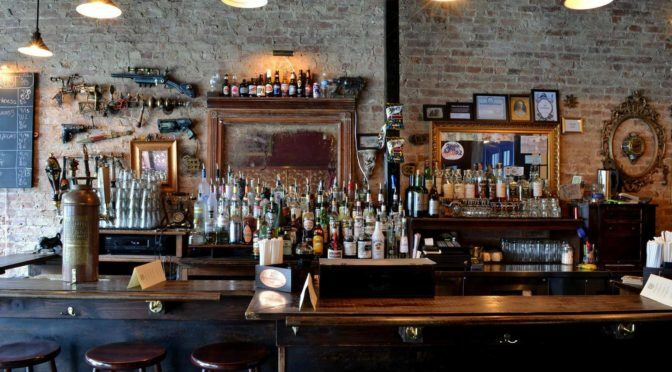 Perhaps you’ve found your way through time and space to The Way Station, the celebrated Doctor Who Bar in Brooklyn. Or, perhaps you’ve been tinkering with cocktails for years to find that perfect match for your fandom celebrations. Or maybe you’re just looking for a great guide to creative, intriguing cocktails. 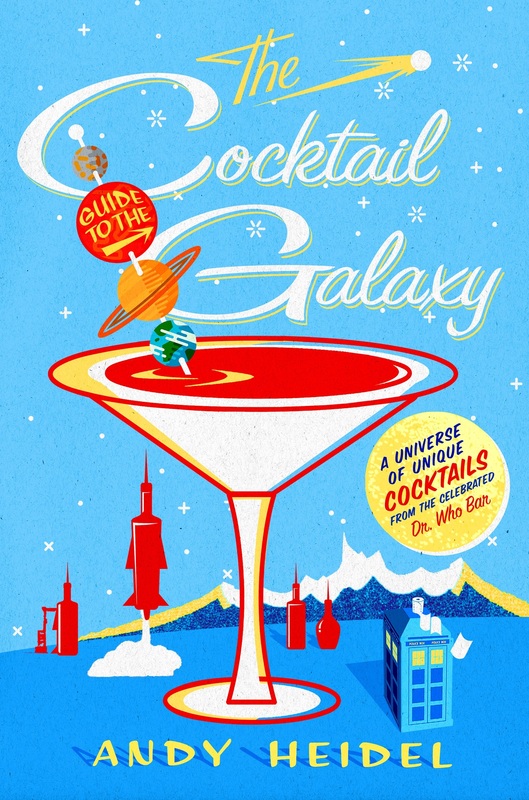 You’re in the right place, with The Cocktail Guide to the Galaxy. Andy Heidel is the owner of The Way Station, a bar and music venue in Brooklyn, NY. 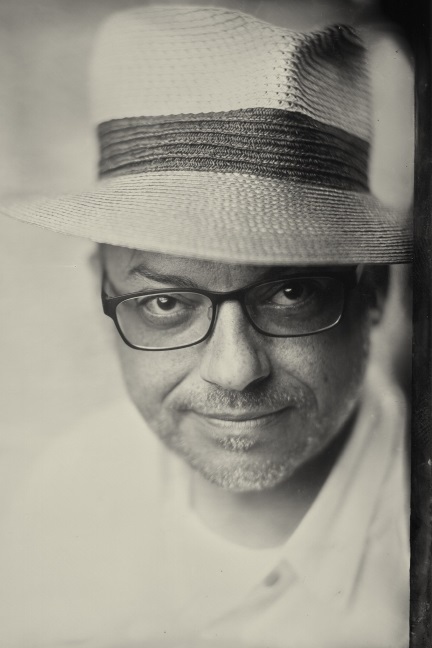 As R. Andrew Heidel, he is the author of the short story collection “Desperate Moon” which features an introduction by Harlan Ellison and praise from Ray Bradbury. As a book publicist, he launched the Eos imprint and helped make Neil Gaiman, Terry Pratchett, and Neal Stephenson bestselling authors while with Avon Books and HarperCollins. 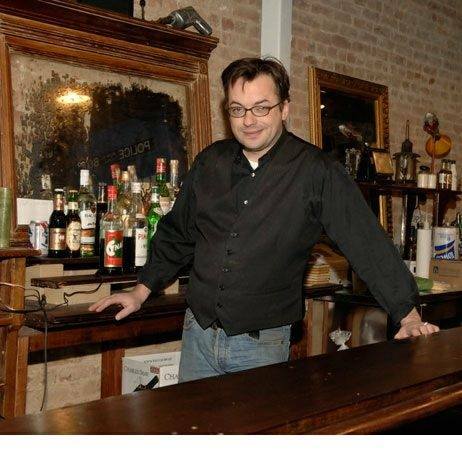 He turned to bar ownership when he was downsized, and hasn’t looked back since. I love when people deeply include things they love into their lives. Such is the case with Heidel, in his work and book! 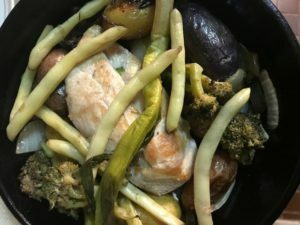 The Cocktail Guide to the Galaxy is a cookbook and mixing guide that is genius (here’s another interview I did with him). The recipes (over 100) for cocktails are clever – and hilarious. Whether your fandom is Game of Thrones or Doctor Who, Star Wars or Star Trek, Ghostbusters or Lord of the Rings, this universe of cocktail recipes will enliven your life – and parties. I suggest trying them while watching your favorite shows and movies, to add an extra dimension to your viewing. A nice dry aged, bone in porterhouse, purchased from www.fleishers.com down the street from me and cooked in my cast iron skillet. Cheese, hot sauce, box wine, spoiled leftovers. 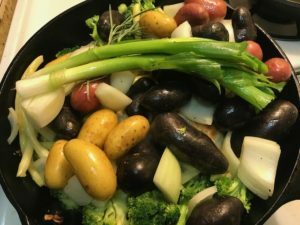 Someone who sees cooking as a creative act and a devotional prayer. Someone who is lactose and gluten intolerant, has nut allergies, doesn’t like spice, insists on eating vegan, then orders a habanero chocolate chip nut milkshake with a side of bacon… and then gets sick. Mollie Katzen. I still have my Moosewood Cookbook from 25 years ago. I think I last referred to it 15 years ago. 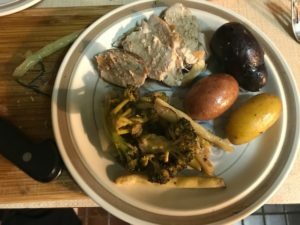 I’m much happier making mashups of recipes and cooking on the fly. My cast iron skillet, which I call “Star Killer.” (Hint: it inspired the name of this dish.) Once a star begins to fuse its elements into iron, it explodes across the cosmos. The cast iron skillet I use came from the heart of a dying star and that’s kind of awesome. Neil deGrasse Tyson, I challenge you to a Star Killer Cookoff judged by Baron Ambrosia and commentated by Eugene Mirman. 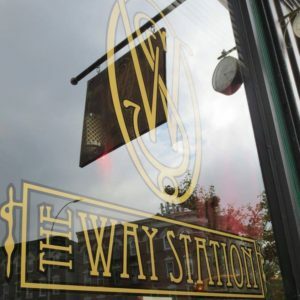 Maybe at the next Astronomy on Tap at The Way Station? My baby’s got Baby Bok, Baby Bok, Baby Bok Choy. Anthony Bourdain. Man, I want to drink tequila and eat bbq with that dude. Cheese. Especially stinky soft melty brine washed cheese from Crown Finish Caves in Prospect Heights. Tofu and collard greens. Also, sand. Write with my partner and drink. Sleep. Dream of electric sheep’s milk cheese. The farm to table movement—chefs caring about where the food they are serving is coming from. On the couch with my partner. I’m not telling, then everyone would go there! Secret. Shhhhh. Do you have any tattoos? And if so, how many are of food, fandoms, or cocktails? No tattoos, but I bartended an event at a tattoo parlor once, if that counts. First, make yourself a drink. I made The Divinian (my 5th Element Cocktail) before documenting this, one of my go-to recipes, then turned to a nice sauvignon blanc out of a box because I was too busy cooking to make myself another cocktail. 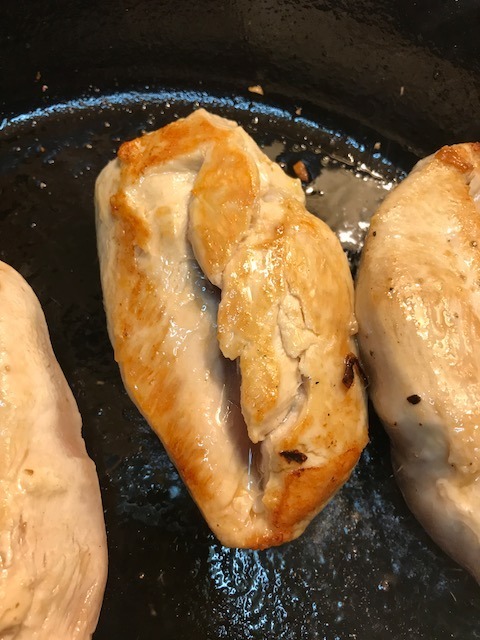 1LB boneless Chicken Breast (two thick breasts). A warning about the photos: I took them with my iPhone. I was making not only dinner, but also enough leftovers so my partner has lunch to bring to work for the rest of the week. 1) Preheat oven to 425. Get an oven thermometer. I have to set my old gas oven to 560 in order to reach 425. 2) Place the cast iron skillet on stove on low and add enough olive oil to cover bottom of skillet. 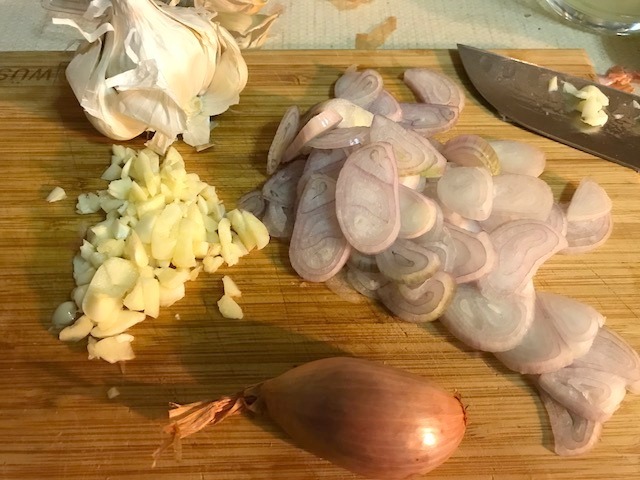 3) Thinly slice shallot and coarsely chop garlic. Add to skillet. Add a little salt and pepper. 4) As shallots and garlic caramelize, roughly chop broccoli, onions, potatoes, and put in bowl. 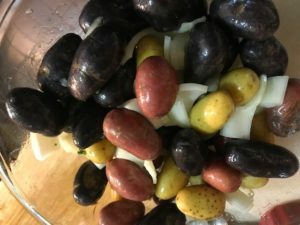 Add beans and dress with olive oil, salt and pepper. 5) When shallots and garlic are nice and brown, place in bowl with the veg and stir till everything is nicely coated in the oil, add more salt and pepper. 6) Turn up the heat to high under skillet. 7) After a minute, add the chicken and salt and pepper on the top side. 8) After 3 minutes, turn the chicken over. It should be a nice golden brown. 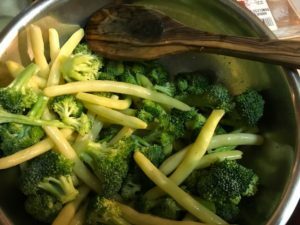 9) Add all the veg from the bowl. Place scallions over the top. 10) After 3 minutes put the whole kit and caboodle into the oven. 11) After 20 minutes, give the veg a stir. 12) After another 20 minutes, check the temperature on your chicken with a thermometer. It should be about 145 degrees. Once it is, pull it out and put on a cutting board to rest and leave everything else in the skillet to cook. If the chicken is not at temperature, bake another 5 minutes and check again. 13) Check your potatoes with a fork. If the fork goes through easily, they’re done. If not, put back in for another 10 minutes. 14) Plate and eat and drink.